I’m a meat and potatoes kind of girl. No meal seems quite complete with me without a potato on the plate! But vegetable gardening for a crop as large as potatoes can take a LOT of space. This project for growing potatoes is so simple and yet very effective. Just combine everything into a large trash bag. The potatoes will grow in the bag itself, saving the space for other veggies and works really well. 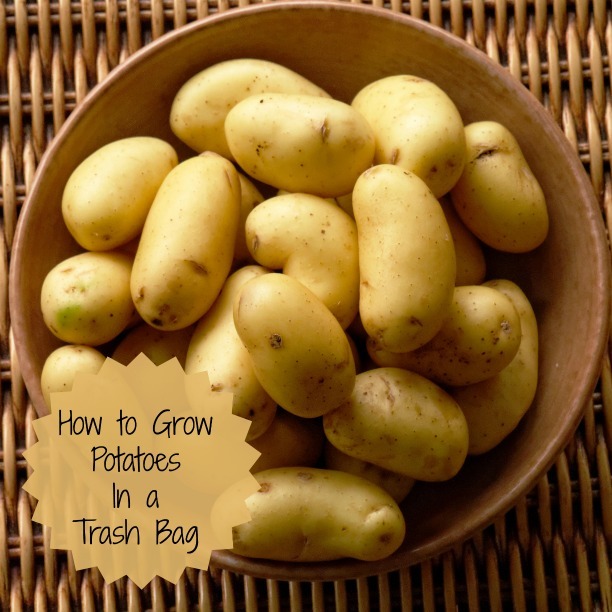 Growing Potatoes in a 30 gallon trash bag. seed potatoes or store-bought organic potatoes. straw or dry leaves for mulch. Growing potatoes can be a chore and take a lot of info and space. Or you can do it the easy way, in a plastic bag. It also helps to get children interested in gardening doing it this way. And it is an almost foolproof way to grow potatoes. Place your bag into a place in your garden that gets 6-8 hours of sunlight a day. Roll down the sides of the trash bag and cut some holes in the bottom so the soil will drain well. Fill the bag with your chosen soil mix and plant the potatoes about 2 or 3 inches deep with the eyes facing up. Cover the potatoes with soil mix and water well. Add mulch such as dry leaves or straw to aid in moisture retention. Keep the plants watered evenly but do not let the soil get soggy. When the shoots are about 7″ tall, roll the trash bag up a little and add some more soil. Keep repeating this process as the plants grow. Once you see the leaves turning yellow, and the foliage starting to dry out, stop watering. This will allow the potato skins to dry. To harvest the potatoes, simply cut the side of the trash bag and remove them. What did your harvest look like? How many pounds of potatoes did you get from each bag? Hi Mollyann. It depends a lot of your conditions. Basically you will get more growing them in the ground but doing them this way is a good idea if you are short on space. They look much the same as normal potatoes, but the bag does settle as the growing continues. It if it support by some sort of wire frame work, it will stand up better. Again, how many pounds of potatoes from each bag? HI Annie. It all depends on how many seed potatoes you use. Sounds like a perfect way to grow carrots. I’ve been wanting to try growing my own potatoes this season. I love the red and Yukon Gold. I’m going to give this a try. Thanks for sharing. Do you need to poke holes in the bag for drainage or is that not necessary? I’m loving your website/blog! I am brand new and am researching my very first garden ever! can you grow sweet potatoes the same way (in the bag)? hi im so glad i found u…i just made myself four beautiful garden boxes and filled 6yards of good garden soil into them 16″ high x 7′.5″ x 4′ each. made of cedar. now my back is out and I’m unable to do much. so I’m pretty sure ill have to aim for next year.however i do have some garlic seeds from the tops of my late father in laws garlic that he planted years ago all over his yard at the cottage.im gonna attempt to plant them. where in the garden is a good place and how far apart.oh and can i plant more seeds that i harvest this year for next fall too.? ?